After requesting a ticket for Taka Kigawa, I was asked by one of Poisson Rouge’s managers if I “needed any more information about the pianist.” Whether I did or not, I couldn’t conceive asking for more about this singular artist, since every program played by Mr. Kigawa is an adventure into the unknown–and part of the joy is not knowing more, is letting the mysteries unravel by themselves. The Taka Kigawa adventures lead us into gardens of strange aromas, through the sequoia forests of Bach’s Art of the Fugue, and last night, Mr. Kigawa cut his way through the underbrush of some pretty dense jungles, with the work of three enigmatic American composers. We all try to prepare ourselves for the Kigawa challenges and each and every recital. But reading the score and listening to Elliott Carter’s Night Fantasies is only confusing: one must wait for a pianist to show that this lack of surface logic makes perfect unconscious sense. The program notes might have been guilty of hype by naming Carter’s Piano Sonata as “the greatest piano sonata of the century”. But listening to Mr. Kigawa play the Carter, one feels that this is a work with the greatest depth. The short Preludes Sean Shepherd may have been more intriguing bagatelles than the deep Carter works. But they showed a young composer who obviously knows exactly what he’s doing. As did his artist of the night. The evening’s endless calculus of notes cannot possibly call for an unassuming confidence, but plowing through the scores, tossing each page to the ground as he finished, his fingers ran the gamut. A young artist of Mr. Kigawa’s unerring perfection obviously knows where he’s going, even when the trip seems most arduous. At my first live performance of John Zorn’s work Carny, I had been astounded by the variety of moods and the straight almost academic playing by Stephen Gosling at BargeMusic. Taka Kigawa’s performance was more light-hearted, more bluesy, and inevitably the work showed its shortcomings too well. Rather then being taken in by the surprises and changes, Mr. Zorn here showed a pianistically stern but still lackadaisical way of following his inspiration. Instead of perking up at the quotes from jazz and serious composers, instead of following the music as well as possible. Carny sounded all too much like stuff found on the cutting-room floor and assiduously roped together. The disappointment came not with Mr. Kigawa’s performance, but the unconscious disrobing of the emperor’s new clothes. Pair Mr. Zorn’s “though-composed” Carny with Elliott Carter’s late Night Fantasies. As in the Zorn, no definable theme, no links can be found. Rather, we have a trip through the unconscious, in this case the sleeping unconsciousness of the composer. And as in sleep, the logic is never ever “logical” as in our waking moods. Mr. Kigawa didn’t have to add anything to the music. The phrases appeared and, like Alice’s Cheshire Cat, evaporated, the brilliant repetitive chords in the middle and end had their own meaning–but none of this meaning meant anything outside of their sounds themselves. The sudden mood changes came not–as with Zorn–through a new inspiration, but through an emotional link which we can only sense. Our minds are taken on a magical mystery tour which leaps or sidles from place to place but which seems both foreordained and inescapable. Carter’s Sonata was and is a thundering piece which, in a way, does supersede Ives’ work. Carter needs no quotes from other songs, no literary titles. Written, more than 60 years ago, it darts from place with a vast concretion of rhythms and harmonies. In fact, the second movement fugue comes as a relief of recognition. 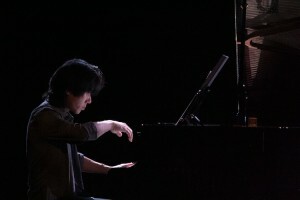 Yet the way Mr. Kigawa performed the Sonata, it was also an exercise in melody. Very American melody at that. Under the outer morass of notes, one could feel the music of Roy Harris or even Aaron Copland. Not as imitation, but as Carter’s once again intuitive understanding and structural harmonic secrets binding it all together. I had never heard the music of Sean Shepherd before, but these three Preludes offered an intriguing soundscape. The first, with its motivational repetition was a study in sounds. The third was an essay in resonances, with memories of those preceding it. But the second Prerlude was – in this most serious recital – a moment of relief. Mr. Kigawa’s virtuoso playing resembled, with no imagination, the music of Tex Avery, the genius behind the Bugs Bunny/Roadrunner cartoons. That Mr. Shepherd should insert a dissonant version of Brahms’ Lullaby was surprising, but superfluous. The music – as was all the music of the astounding Taka Kigawa - spoke for itself without the need for either amplitude or embellishment.